Millions of pounds of Government cash has been secured for measures to try to improve public transport and air quality in Leicester. The Department for Transport has today announced some £8 million of funding for Leicester City Council. The council says the majority of the cash – £6.25 million – will be used to develop a network of walking and cycling links to connect the city centre to the two universities, as well as the Waterside regeneration area on the banks of the Soar. 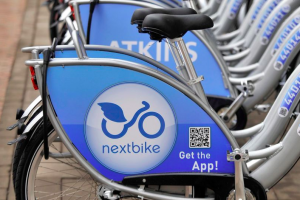 Some £500,000 will be used to create a new public bike hire scheme. The council says it is likely to include 500 bikes available for hire from some 50 docking stations across the city. The network of docking stations will cover the planned Space Park off Abbey Lane Park, the nearby National Space Centre, city centre work places, universities, hospitals, and the The King Power Stadium, Tigers’ Welford Toad rugby ground and nearby neighbourhoods. The council says it hopes to have the scheme up and running by the autumn. It has not yet been revealed how much it would cost to hire a bike.